It was a promising approach, but a limiting one, ZoomData Co-founder and CEO Justin Langseth said. The company learned pretty quickly — when customers were sending it terabyte-sized hard drives to upload, and it was sending customer boxes of iPads for their data analysts — that historical data and desktops still matter very much, especially when you’re talking about big data. A screenshot of ZoomData for the iPad. The approach, essentially, involves stream processing the results of a query and displaying the results in a “sketch view” that gets sharper as more data is processed, not unlike the experience of watching the first few seconds of a streaming move. Users start to see their data almost immediately and get a good sense of what’s going on, and a short time later they see it all. Langseth said he showed the technique to [company]Cloudera[/company] Chief Strategy Officer (and then-CEO) Mike Olson, who was impressed enough to form a relatively strong partnership with ZoomData. ZoomData has 20 paying customers, Langseth said, and a good number of them are also Cloudera users connecting ZoomData to their Impala or HDFS stores. However, ZoomData isn’t tied to Cloudera or even Hadoop when it comes to the big data backends it supports. The company’s product also supports a collection of popular stores that includes MongoDB, Spark, Amazon Redshift, ElasticSearch, Solr and various relational databases and streaming APIs. Supporting a wide variety of data stores is critical if ZoomData is going to succeed in its lofty goal of unseating [company]Tableau[/company] as the go-to choice for analysis and visualization on top of these environments. Langseth thinks the ability to do real-time and historical analysis in the same interface will be a big help in making this happen, but said the real key might be a focus on user experience. One big part of that is making sure the experience is equally as rich whether someone is manipulating a chart with their fingertips or a mouse. 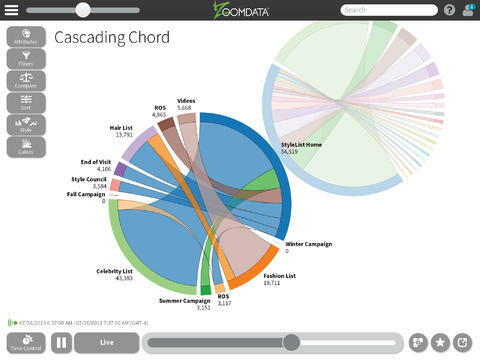 “We’re really trying to make [analzying big data] even easier and even more beautiful,” he said. NEA, Columbus Nova Technology Partners, Razor’s Edge Ventures and B7 also participated in ZoomData’s latest investment round. The company announced its $4.1 million series A round in June 2013.